Wireless is a currently unstoppable. The whole world seems get into in a wirelessing progress. Now we even have wireless robots designed to lean our house and free your hands. Like that wireless surround sound helps you dive deeper into your entertainment without all annoying wires lining your walls and floors. And you have all freedom to locate and relocate the speaker as you wish. When first considering about getting a wireless surround sound system I prefer to do that through Bluetooth as most of you will choose. Why? Because Bluetooth is universal and convenient. Nearly all smartphones, laptops and notebooks have Bluetooth on board. We have already experienced and loved the pleasure of wireless file sharing, wireless printing. Why can’t we just continue to get the benefit of the Bluetooth tech on wireless sound system? It is possible to set up surround sound in a living room using Bluetooth speakers. It’s easy. If you don’t have a Bluetooth-enabled TV then a Bluetooth adapter/transmitter will help to send the signal to Bluetooth speakers. While there have been tremendous advances in Bluetooth tech over the past few years, the fact still remains that Bluetooth products on the market are primarily limited to 2 channels stereo sound experience. For a long period Bluetooth device have been considered as a transitional option trying to satisfy audiophile’s demanding. The fact is that it is also carving out own fields meanwhile. Thanks again to the tech explosion we now have apt-x codec, a low latency coding format using ADPCM (Adaptive Differential Pulse Code Modulation), which brings us nearly CD-quality sound utilizing Bluetooth. Even captious audiophiles are satisfied with sound from those high quality products with apt-X codec. So when just want to listen to stereo music(2 channels) a pleasant result can be guaranteed with Bluetooth headphone or speakers. And of course, the stereo sound will be better with two speakers rather than a single one. Although there are thousands of Bluetooth speakers on the market but just a little amount of them than can pair and gives you more better surrounding stereo sound. 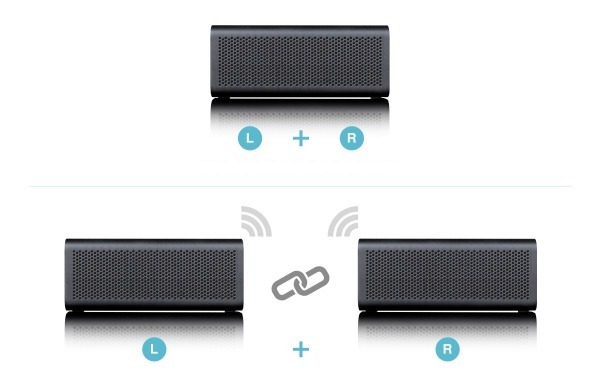 Speakers that can pair to form a Bluetooth surround sound system. 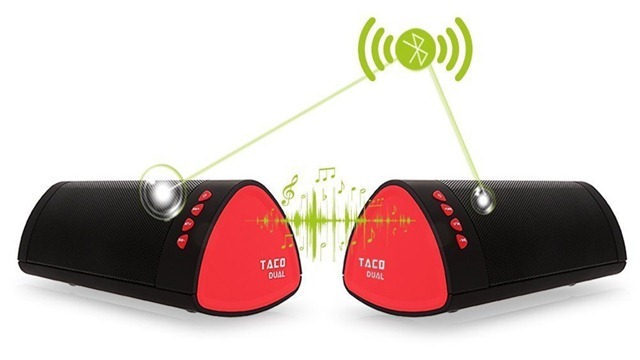 The ability to link two bluetooth speakers together wirelessly with one acting as the left speaker and the other as the right speaker can be considered as a key feature of excellent bluetooth speakers. Two speakers pairs together to offer true stereo sound. You can create a mini or bookshelf level surround-sound system with these Bluetooth speakers. If you like some tiny sized ones can be even carried with you during travel period to beaches, forests and mountains not to mention from room to room. Most portable Bluetooth surround stereo speakers have a rechargeable lithium-ion battery that offers four hours of wireless play. 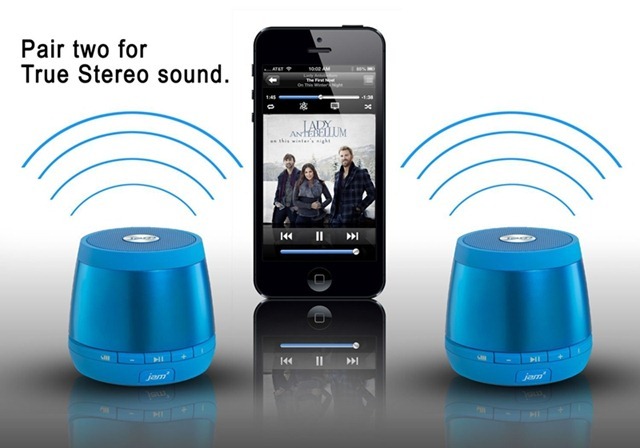 Stereo function Stream your music over Bluetooth by syncing with a compatible device. DSS (Dual System Streaming) to pair two SFQ-06 devices together to play left and right audio. Wirelessly connect two UE BOOMs together in stereo via the UE BOOM app. 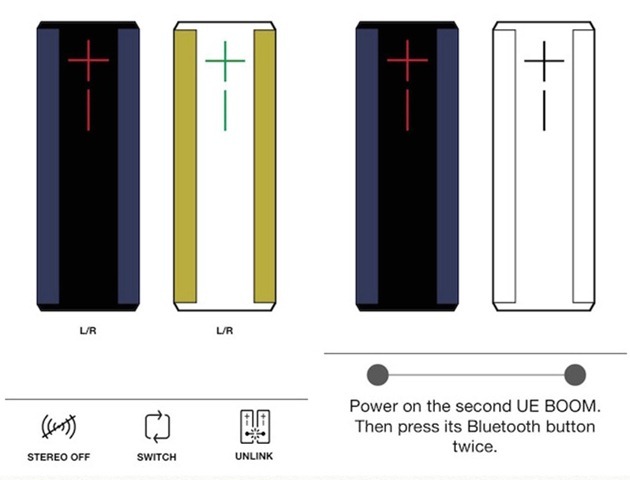 Wirelessly connect two UE BOOMs together in stereo via the UE BOOM app. True Wireless pairing compatible with a second Braven 805, 850, 855s, 1100, or BRV-HD speaker. Very Powerful Bluetooth speaker easily fill up a big room with stereo surround music 360-degree wireless speaker and IPX7 360-degree wireless speaker and IPX7 The Braven 710 features aptX encoded audio for flawless sound and an IPX5 water resistance rating. With a metal case Sound Platform 2 seems more appealing than its predecessors. It is a bookshelf level speaker with a weight of 6.4 pounds. Just like older speakers heavier speakers tend to produce better sound quality. One single Sound Platform 2 can fill a small room with well-balanced sound. But when two identical units pairs as preferred the audio impact is tremendous with more basses and details. The sound quantity and quality significantly increase simultaneously when UQ3 activated. UQ3 is designed to create better stereo separation between the Sound Platform 2’s pair of 3-inch drivers. Stereo separation is the most big focus for Soundfreaq. It offers a unique combination of performance, flexibility, affordability and, potentially not often seen in other similarities. Braven 850 is a product trying to bridge the gap between homebound wireless speakers and travel-ready portable ones. It has an excellent battery life of 20 hours per charge better than any others and the 8800mAh battery is enough to recharge any mobile device you have as well. The solid industrial design would exudes a premium touch especially the industrial-grade aluminum grill case. Braven 850 originally have a bolder and rich tone and wits bass thumps accordingly to the beat. The 850 also supports other audio enhancements tech like apt-X, SRS WOW HD audio, and True Wireless. SRS WOW is added to better presence in the bass frequencies for bringing additional punchy tones. 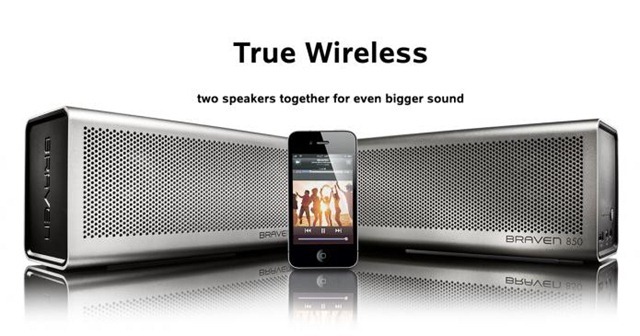 True Wireless allows you to pair another speaker to use them together as a two-speaker wireless sound system with discrete left and right channels. So its sound quality is pristine and powerful. Beside being pretty heavy and expensive the Braven 850 is almost a perfect bluetooth stereo system you can get. Braven 710 has an anodized aluminum round cornered package. It is portable and suitable for briefcase. Besides being attractive this Bluetooth speaker has water-resistant physical design. The most important feature we like it has been the ability to be paired with a second 710 or Braven 850 speaker to compose a true Bluetooth stereo system. Other handy tricks like the function to charge other devices and aux in and out compatibility also indicate the excellent quality of it. If a distinct Bluetooth speaker has a mantra, it needs to be simplicity. Unlike many other rectangular Bluetooth devices you have seen.The UE BOOM 2 are more like a cylinder and this cylinder is enclosed to reach IPX7. While you can double it with an additional UE speaker, one of these should be more than enough for a small get together in a busy park. I-VENSTAR Portable Bluetooth Speaker features new Bluetooth 4.1, apt-X codec and NFC. The rubberized silicone shell is easy to grip and the metal speaker grille is durable. This device has a sturdy feel, and sits well in both horizontal or vertical positions. 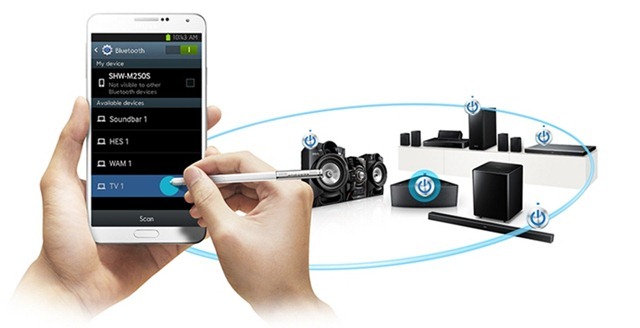 The duo pairing pattern will produce truly wireless surround stereo sound. As a general purpose speaker the audio is good. It will give you a powerful experience and produce full sound. Only when the source volume is fully cranked up it will have a slight bit of distortion. But its price is quite appealing. For less than 40 bucks, you will get a sleek matte black finish, dual pairing technology, and 6 Watts mini Bluetooth surround sound speaker system. HMDX Jam plus is the most cost effective Bluetooth surround sound speaker on the market. It is small, lightweight and multi-color available. Like others Jam Plus Bluetooth speaker allows you to pair a 2nd Jam Plus speaker for true stereo sound and the operation is just simple. On the bottom of the speaker, there has a sliding switch says L-mono-R. Move the slider of one speaker to the left position and the other to the right opposite. You should turn the L speaker first and then the R one. Then you will hear some chimes follows a brass drum sound that will indicate two speakers have paired. Now you are prepared to connect to your Bluetooth device. The reliable quality obviously will depend on the music source as well as the actual sound system. That said, it was fairly impossible to tell the difference between playing music while attached by wire, or magically beaming it through the air up to 33 feet away. 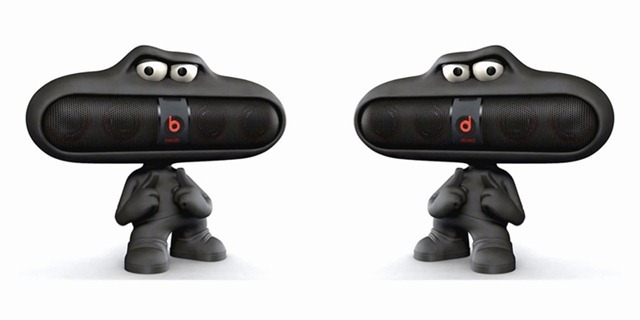 The Beats Pill 2.0 is a high quality portable speaker and stands out from the crowd. The strongest feature is its design.The cylindrical speaker is hand size and available in blue, black, red or white. It has physical volume controls, audio in and out ports, and even a hidden USB charging output for your smartphone. Within a so small case it has four tiny 1-inch speaker drivers to produce clear and detailed sound. It’s easy to enjoy soaring highs and deep booming bass from Beats Pill 2.0. All through wireless and cord-free way. You can sync two pills together to play the same song. Or even to stereo your music. And you will find out the Beats’ accessories are also top-notch. Something that will disturb you will be the price for similar speakers that get the job done at far less than the Pill’s. The only reason that will consolidate your decision will be its unique style and design. So all in all the Beats Pill 2.0 is a good personal audio device. When we want to appreciate the true majesty of movies on Blu-ray with 5.1 or even 7.1 channel sound you really need a decent surround sound system. But things don’t go flawless as expected as we presumed when Bluetooth turns to multi channel surround sound. It seems like transmitting this kind of audio signal through Bluetooth is a challenging job for ever professional audio engineers. On the contrary Bluetooth seems to have some natural disadvantage for audio transition when it comes to multiple channel surrounding sound. It likes that is some kind of unfortunate weakness born with Bluetooth. Partly because Bluetooth is point to point(sometimes point to points) method. We can hardly separate surround sound signals into multiple channels. Even we manage that the transmission of the signal to each speaker wirelessly through bluetooth is still difficult. The interference between several Bluetooth transmitters and receivers will damage all your previous efforts. Quality of audio file, amplifier and speaker come all together to determine the playback result you will get. With a Bluetooth device, we cannot barely get the first basic necessity to make good sound. Even though those systems offer surround speakers with wireless audio delivery, they aren’t truly wireless. Now frankly speaking there are just few bluetooth audio systems can deliver multi-channel sound, and even less can give us pleasant result.When searching for Bluetooth surround sound in most cases the results are frustrating. Most devices we found are merely a wired sound system with a bluetooth receiver. The Philips HTL9100 is different. 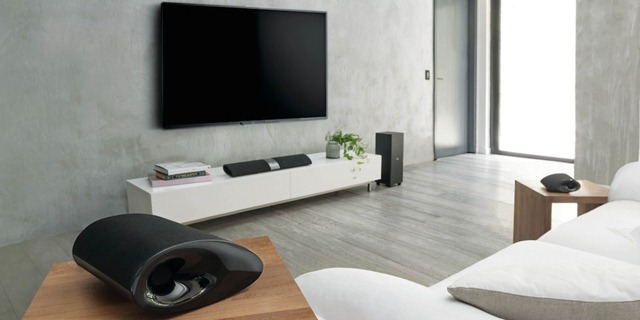 Unlike merely a wired sound system with a bluetooth receiver it utilizes Philips’ proprietary wireless audio technology and a unique design to overcome the difficulty we mentioned above. It looks like any ordinary soundbar but the ends are actually satellite speakers tan can escape from the main unit. 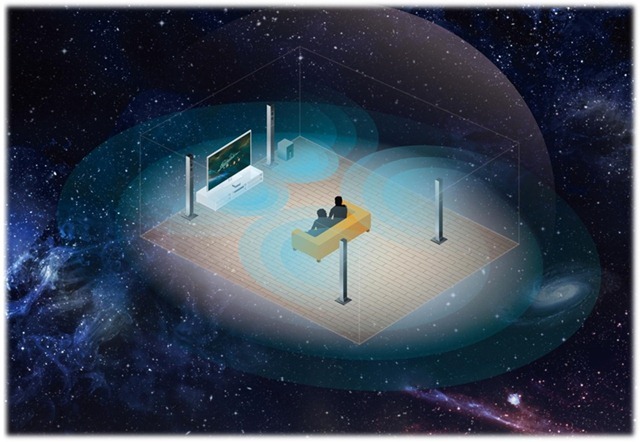 Once the satellites detach it turns into a wireless surround system that gives out convincing surround sound. These two satellites communicate with mothership via a 5.8GHz to avoid interference. You don’t even have to plug them into a power source to juice up the built-in amplifiers. They run on rechargeable batteries that provide up to 10 hours wireless music. This one looks good, sounds good, super simple to set up and the modular satellite speaker experience is fun. We think the surround-on-demand option is a really neat idea.If you don’t need full 24/7 surround sound, don’t mind moving the speakers when you want it and you do want good sound without the hassle of trailing cables. That is it! This is our review. An optimal Bluetooth surround system can give better sound, greater range, and the ability to play more than one speaker at a time compared with general ones. Philips Fidelio HTL9100 – Sound bar system brings us good sound but it is actually a hybrid (2.4GHZ and 5.8GHZ)wireless system. In fact I wish and bluetooth could do better in this field. Theoretical transmit rate of Bluetooth is up to 11Mbit/s current audio encoding theme use only just trivial partition of that. A possible option is Apt-X Enhanced that is compatible with 5.1 channels audio signal through Bluetooth method and has already been adapted into Cinema Surround Play-Out Systems (5.1). Maybe in the near future, we will find that bluetooth creates an inexpensive wireless surround experience approaching that of an actual movie theater with this more promising apt-X Enhanced audio codec. But now you have to switch to wifi to get a real practical 5.1 wireless surround system. I am using Philips audio system for my home theater and it’s working great so far. The sound quality is good an clear (better then some other expensive brands) and cover my big hall very well.